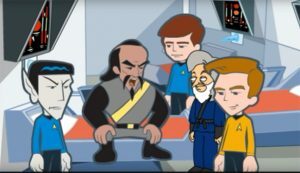 "Where the Other Star Trek Original Series Stories Are Told"
Although this is the 3rd episode in the Federation Files, it is actually the prequel to episode #1, “His Name is Mudd”. This vignette introduces then Commander McCann who, we discover is on a secret undercover mission infiltrating behind enemy lines trying to gather Romulan secrets for the Federation. 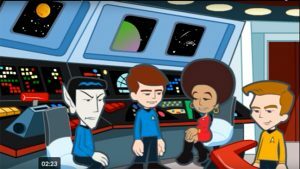 This episode also introduces the USS Nikita, Captain Randal, crew and the special Maco team sent out on a rescue mission to find and recover Commander McCann. A Star Trek fan production based on the original series episode, Mudd’s Women which aired 50 years ago, October 13, 1966. 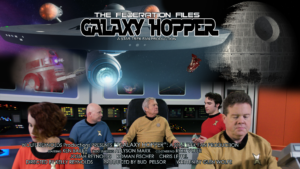 In this episode, The Federation Files, “My Name is Mudd”, Harcort “Harry” Fenton Mudd joins the star ship U.S.S. Constitution and its crew with Captain Charles McCain. 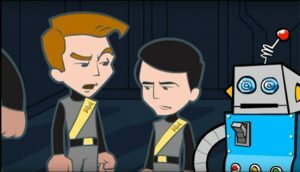 In typical Mudd fashion, nothing goes smoothly on this mission to rescue Mudd’s son and friend who have been hijacked by a race who are not in the current Starfleet data base. 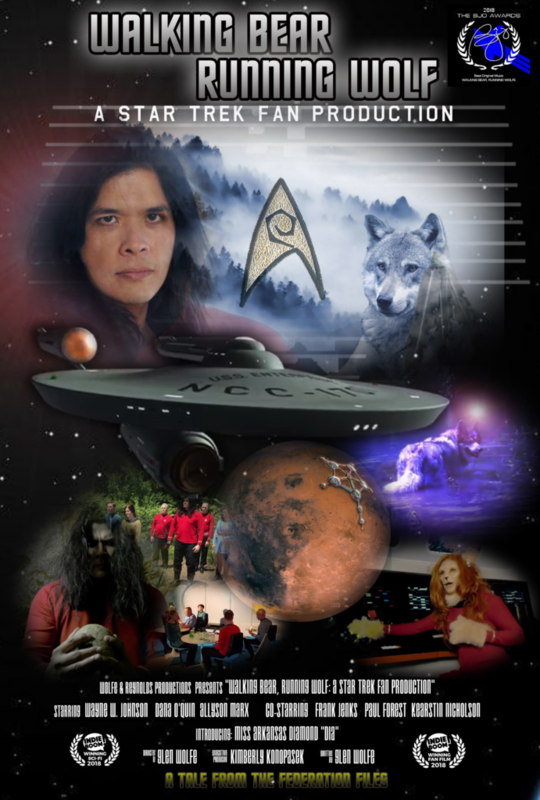 Episode #2 of The Federation Files, “Walking Bear, Running Wolf”. 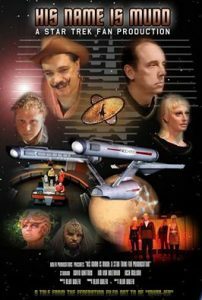 A Star Trek fan production based on the original series timeline. 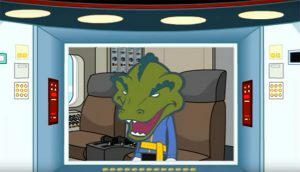 Lieutenant Dawson Walking Bear, who was first featured in Star Trek, The Animated Series, is featured in this episode where he begins to see visions of a wolf roaming the USS Enterprise corridors. 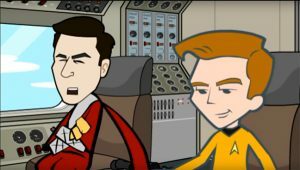 Dr. McCoy has no explanation medically for Walking Bear’s hallucinations but says there may be a correlation between his and his mother’s 30th birthday who was lost on a deep space scouting mission. The suspense heightens when Walking Bear is confronted by the unexplained on his next away mission. Another ‘come to life’ character from the animated series, the cat-like alien, M’Ress.  The USS Lexington is on a mapping mission just outside the Galactic Rim when they discover a floating, unidentifiable metallic object of unknown origin. Beaming it aboard disables power to the ships engines and the crew tries frantically to get the engines operational before they drift into the rim. A science team is trying to learn more about the ‘Droid’, it’s origin and any data it may hold. The clock is ticking for the Lexington as it drifts dangerously close to the Galactic Rim. Will they survive in time and will this unknown ‘droid’ play an important part in their ultimate fate? 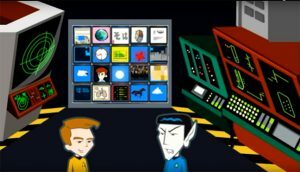 Star Trek and all related marks, logos and characters are solely owned by CBS Studios Inc. 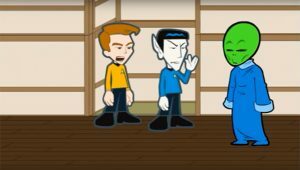 The videos, the promotion thereof, and/or any other materials created by Star Trek Fan Films are not endorsed by, sponsored by, nor affiliated with CBS, Paramount Pictures, or any other Star Trek. The U.S.S. Enterprise encounters two war vessels that have been a war so long no one on either side lives and only the two vessels shoot at each other in a never ending battle run by their on board computers. 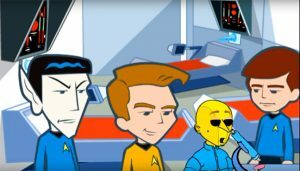 Captain James Kirk and his crew trick the ships into leaving Federation space. The Enterprise encounters a giant space entity known as the Gola that warps time. When Spock discovers that it is an infant the crew takes it home. They also run into two fellow humans from Earth who left the planet in the age of the barbarians and still live as such. 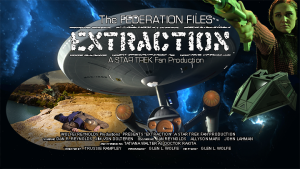 The Crew of the Enterprise has to uncover a string of thefts of Federation robots. When it is revealed that it is the Romulans the Federation fears the worst and have to stop the war before it begins. 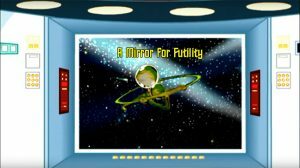 Captain’s log… 5468.2: A request has been received at Starfleet Headquarters from a recently contacted civilization – the system of Marpaplu – for accreditation as an associate member of the United Federation of Planets. The Enterprise has been ordered to Marpaplu to consider final processing of the Marpapluan application. Captain’s log, stardate 5466.9. The Enterprise is in orbit around the outpost colony world of Ribol II, on orders from the Federation Agricultural Division, to try and find a solution to the destructive plague of dranzers, which wipes out seventy to ninety percent of the grain crop every sixth year. A landing party of Doctor McCoy, First Officer Spock, and myself has beamed down to the Ribolian surface to survey the problem first hand. Mister Newt Henderson, of the Ribolian Settlers League, has taken us in hand. Captain’s log, stardate 5442.8. First officer Spock and I have been directed to act as Federation representatives to discuss conflicting claims to the metal-rich uninhabited world about Star WWB7. We are proceeding on course to the neutral world of Pomplance to meet with Ambassador Koft of the Klingon Empire and Envoy Bendes of the Romulan Sphere. Captain’s log, stardate 5444.9. The Enterprise is on a charting run through the partially explored Moran Sector. Since this region seems relatively devoid of suns and planets, we expect to be finished here in a few days. Kirk out. Captain’s log, stardate 5440. The USS Enterprise has been ordered to transport the pet waul of the Moauvian ambassador from Centaurus Base to his home world of Moauv. We are proceeding on course… as rapidly as possible. Captain’s log, stardate 96.024. It’s been an exhausting, but rewarding, time for the starship Enterprise. Meeting intelligent dinosaurs, fighting a super-criminal, and defeating the Romulans has thrilled each and every one of us, but it has tired us out, too. So it is now a pleasure to comply with Starfleet Command’s order to bring a new member of the Federation back to their home in the Garr system, while giving them a tour of our mighty ship. The ambassadors from the planet Garrus seem harmless enough, their child-like size and innocent faces have charmed almost everyone, but sometimes they seem just a little too harmless.  Please contact us if you want to know more about WARP 66 Studios and how you can be involved either in front of the camera acting, as a member of our volunteer crew personnel or possibly jusy helping out behind the scenes on one of our future productions.